If you have a cat with a flea problem you just can’t get under control or if you want to preemptively treat your kitten to keep the bugs away, the best flea shampoos for cats are your best bet. But what is the best flea shampoo for cats? We researched the most popular and top-rated products to find out. Before we get into our product reviews, let’s take a look at some of the important factors to consider when choosing a flea shampoo. Natural: Believe it or not, there are some natural ingredients that are pretty effective at getting rid of fleas and other bugs. Plus, natural products are the best choice for kittens or cats with sensitive skin. Control Time: Some of these last quite a while but there are some that you should reapply every week or so. Generally, shampoos with harsher chemicals have a longer control time than natural shampoos do. 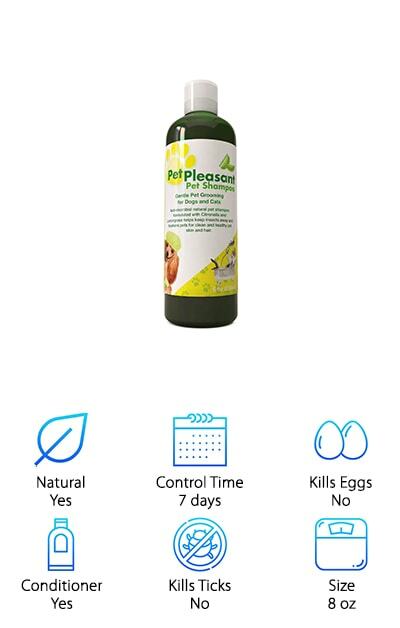 Kills Eggs: Killing flea eggs is hard and there aren’t a lot of products out there that can do it effectively. For shampoos that don’t kill eggs, repeating the treatment every 2 weeks will take care of the hatching eggs. Conditioner: Fleas can lead to dry, irritated, raw skin. They’re itchy and all your cat knows is they want it to stop. Conditioner will not only leave their coat looking great, it can help soothe their skin, too. Kills Ticks: Ticks can be pretty difficult to kill but some of the harsher formulas easily take care of this pest along with fleas. If you want expanded protection for your pet, get a shampoo with flea and tick coverage. Size:These bottles come in a lot of different sizes. Keep in mind that they’re not all ready to use shampoo. Some are dry shampoos and others are concentrated and need to be added to water before using them. Now that we’re taken a look at our flea shampoo buying guide, let’s get right into our reviews. If you’re in a hurry, start with our top and budget picks. They’re right at the top of our list and are the best way to get an idea of the range of products that are available. All of these products are worth a closer look, though, so stick around until the end if you can. Okay, let’s get right into our reviews. Our top pick for good flea shampoo for cats is from Paws & Pals. This shampoo combats fleas on contact without being harsh or causing problems for your cat’s skin. In fact, it's specially formulated for cats with dry, sensitive skin so you don’t have to worry about any harsh irritants. This is an all-natural product with ingredients like filtered water, oatmeal, kelp, aloe vera, and several essential oils that give it a really nice, subtle smell. One of the great things about it is that it really helps to soothe your pet. If your cat has amped up the scratching lately because of a bout of fleas, this is a great shampoo that will finally help them get a little relief. Plus, it will help your cat’s fur stay nice and shiny. The effective flea shampoo for cats is also nice on your wallet. Check out Adams Plus Flea & Tick. It’s our budget pick but it isn’t short on effectiveness. 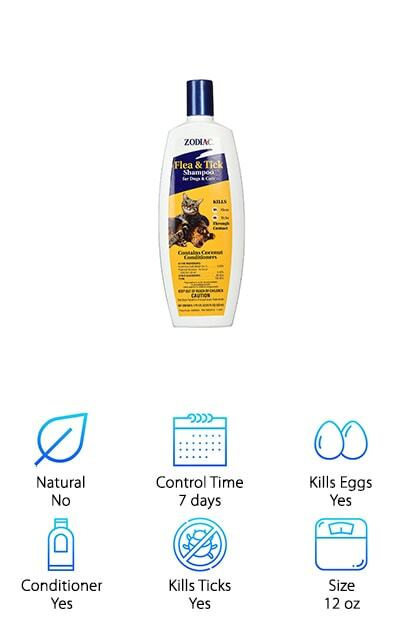 This is a medicated flea and tick shampoo that provides 28 days of coverage and takes care of adult fleas and pre-adult fleas. It also kills ticks, lice, flea larvae and flea eggs. But wait, there’s more. In addition to killing a wide range of bugs, there are also soothing properties as well. The aloe, lanolin, coconut extract, and oatmeal all calm dry, irritated skin. It removes flakes, dandruff, and scales while also leaving the coat soft, shiny, and manageable. That’s important because it will help soothe any irritation brought on by the fleas. One more thing, it’s also a great bargain. Next up is Oster Flea and Tick Shampoo, an all-natural flea shampoo for cats. 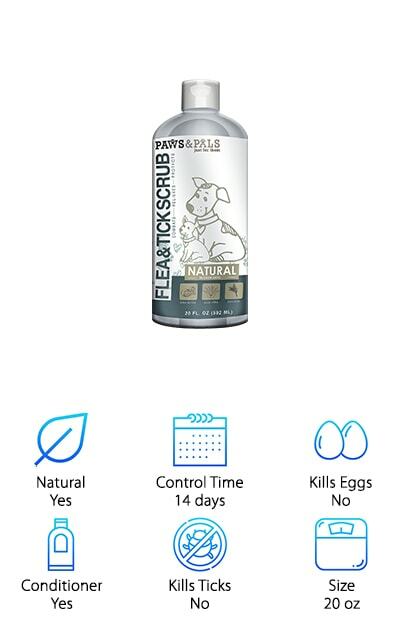 How does it kill fleas if it’s all-natural? Check this out: it uses Pyrethrins from chrysanthemums, a naturally derived way of dealing with a flea infestation. There’s more, it’s also dye free, alcohol free, phosphate free, and has no artificial colors. If your cat is coping with any irritation from the fleas, this is a great choice. It has soothing properties, too, and uses natural oatmeal to help protect the skin from more irritation. Another good thing about this is that it won’t wash off any topical treatments so this is a good formula to use in conjunction with other medicated treatments. And that’s not all, it even has a delicious mandarin violet smell. If you’re in the market for waterless flea shampoo for cats, you’re in luck. Vet’s Best Waterless Bath Foam is kind of amazing. 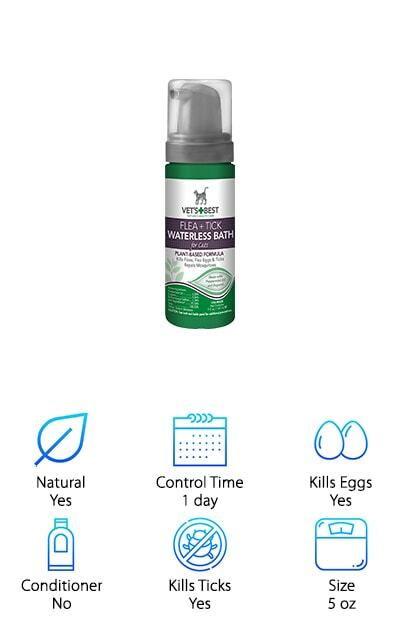 This waterless bath foam not only kills fleas, flea eggs, and ticks, it also repels mosquitos, too. Look, we know that not all cats are going to be agreeable to a soak in the tub. That’s why we wanted to make sure we found options to make it really easy. You don’t even need to worry about rinsing it out. It’s specially formulated for cats and has a number of plant based ingredients and essential oils. There’s no added fragrance but the natural ingredients leave behind a light smell that you'll love. One more thing, this best dry shampoo for cats is for kittens 12 weeks or older. The best flea shampoo for cats that works super fast is the Zodiac Flea and Tick Shampoo. 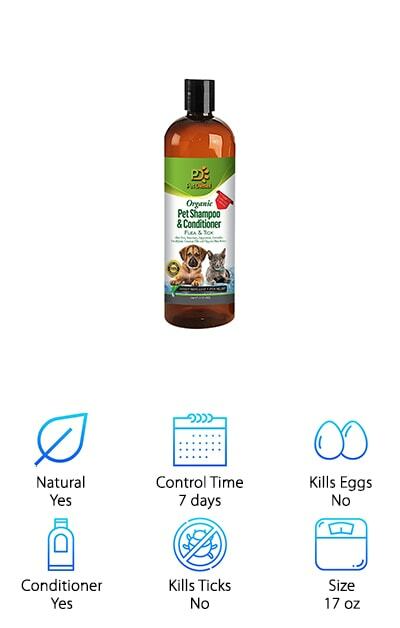 Not only does this shampoo have strong insecticidal ingredients that can take care of fleas, ticks, and lice fast, it also has rich coconut conditioners. The conditioners help protect your cat’s skin and prevent irritation and it makes their hair look smooth and shiny. This is effective on dogs, too, so it’s a great choice if you have a multi-pet home. Another great thing about it is that you can use it sparingly because you only need 1.5 tablespoons per 5 pounds of body weight. Just mix, apply, and lather for 3 to 5 minutes to get great results. You’re also only supposed to use this treatment once a week, too, which make the bottle last even longer. Pet Diesel Flea & Tick Shampoo is our pick for best organic flea shampoo for cats. Here’s how it works. This formula doesn’t actually kill the fleas, it repels them. By combining various essential oils like peppermint, eucalyptus, and rosemary, the fleas aren’t able to get a good grip on your cat. This means they have a hard time eating and will go find another host. Just massage the shampoo in, let it sit for 3 minutes, then rinse and towel dry. Get this: the formula was made to rinse out easily to prevent wasted water. In addition to repelling bugs, this formula will leave your pet’s hair feeling soft and smooth. Plus, it helps soothe irritated skin. One more thing, they have a satisfaction guarantee. If you don’t love it, you can get a full refund. Next in our flea shampoo reviews is an all natural flea shampoo for cats from Honeydew. This formula helps naturally repel fleas and mosquitos primarily because of the lemongrass and citronella. There are no mineral oils, paraben, sulfates, or artificial fragrances either. If your cat suffers from dry, itchy skin, this shampoo helps remove any build up and cleans without any added itchiness. How does it do it? For one thing, there are no harsh chemicals of any kind. Plus, it has antimicrobial properties to help keep odor under control. 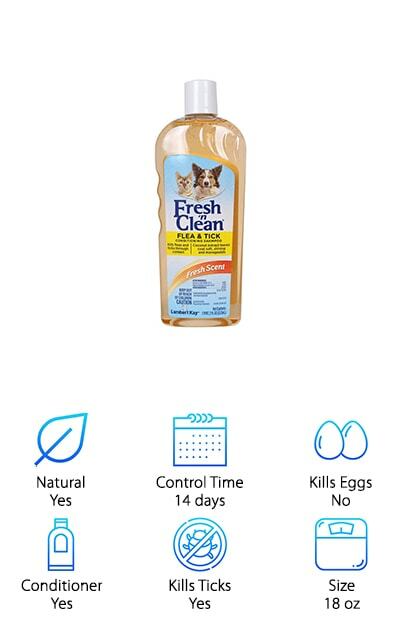 Because there aren’t any harsh chemicals, this natural formula is a good choice for a flea shampoo for kittens under 8 weeks. There’s more. Not only is it gentle enough to use regularly, it’s also tear free and won’t aggravate allergies. Lambert Kay Flea and Tick Shampoo is so effective and gentle, it’s great for adult cats and the best flea shampoo for kittens over 12 weeks old. It kills adult fleas and ticks by using a formula that uses natural pyrethrins instead of harsh chemicals. While this doesn’t kill fleas, the residual effects of the product will weaken the immature fleas when they hatch. This formula is gentle enough to repeat every 2 weeks or so. Continued use will take care of any newly hatched fleas and disrupt their life cycle so that they won’t lay more eggs and start the process all over again. And get this: this shampoo contains coconut extract that leaves your cat’s fur feeling soft and smooth. Plus, it leaves behind a sweet, fresh scent. 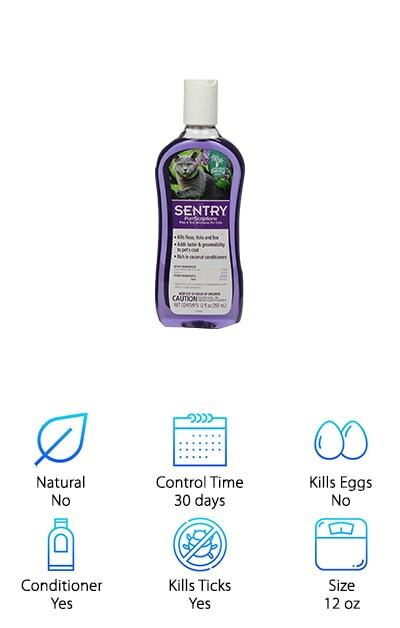 There are a lot of things that we liked about Sentry PurrScriptions Cat Shampoo. 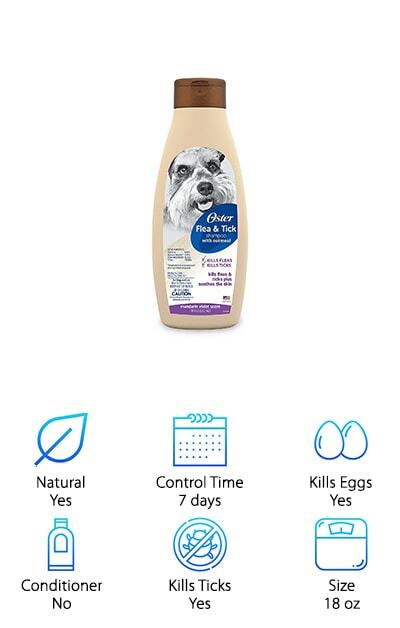 First of all, it kills fleas, ticks, and lice and their eggs. This product is specially formulated for adult cats. It’s a little stronger than some of the other shampoos we reviewed and shouldn’t be used on cats younger than 12 weeks old. How strong is it exactly? Get this: the pesticides in this formula are effective for a whole 30 days, giving you just the tool you need to prevent reinfestation. That’s not all. The coconut conditioners clean, deodorize, and condition your cat’s fur and leave behind a silky shine. The one thing that we absolutely loved is the scent. The fresh coconut berry smell keeps your cat smelling clean and just a little bit sweet. 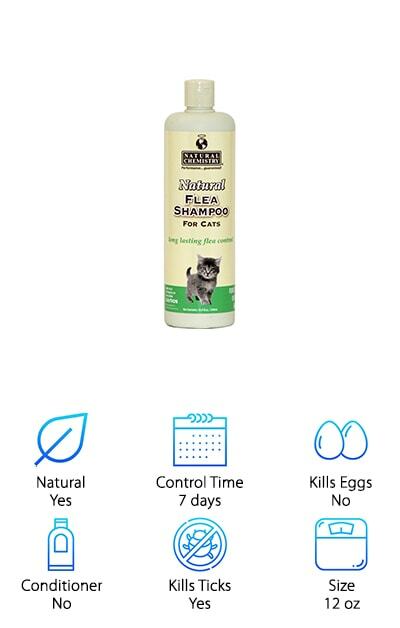 Last but not least is Natural Chemistry Flea Shampoo, a most effective flea shampoo for cats that kills fleas, ticks, and mites on contact. But, it’s still gentle enough to use on cats of all ages. In fact, this is one of the only shampoos we found in our research that doesn’t specify that it’s for cats over 12 weeks of age. This shampoo provides protection that lasts up to one week. It’s ready to use right out of the bottle, which is really convenient because there’s no mixing or measuring required. For best results, lather up your pet then let the shampoo sit for 3 to 5 minutes. This lets the ingredients really get to work so you can make sure your cat is getting the maximum level of protection Natural Chemistry has to offer.